ALERT: This article contains spoilers. 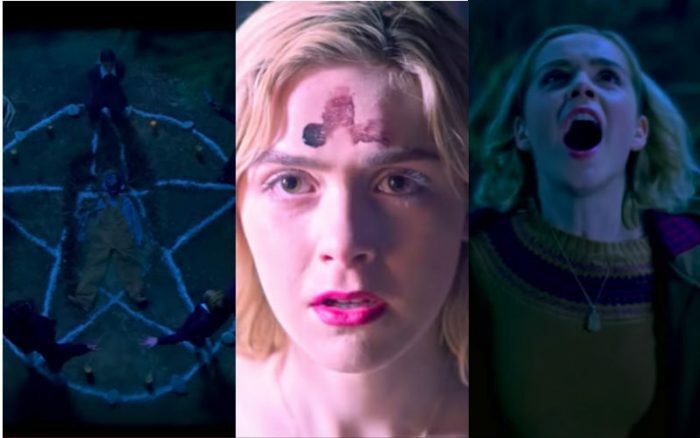 Netflix recently premiered its series, The Chilling Adventures of Sabrina. It’s created a lot of buzz. However, this series has nothing to do with the light-hearted 90’s comedy Sabrina the Teenage Witch, that starred Melissa Joan Hart. The reboot is based on a comic book series published by Archie Comics, and developed by writer Roberto Aguirre-Sacasa. Unlike the old comedy, this new series delves into terror, cannibalism, black magic, and the demonic. The show includes phrases including, “Praise be Satan,” or “For love of Lucifer”, mocking Christian expressions. They also mock Catholicism, as one of the aunts tells Sabrina, referring to her parents’ death, “Your Father was giving a lecture at the Vatican when his plane went down.” Sabrina’s father was a Satanic priest. Chapter Two depicts Sabrina’s satanic, or “dark” baptism, during which the characters invoke Satan as a god. During this conversation, the Satanic priest asks her to sign her name in the Book of the Beast, pledging her loyalty to Satan. The priest says, “Incorrect! He is the embodiment of free will. The priest also explains to Sabrina that her father was “granted a special dispensation” from Satan to marry her mortal mother, because witches are not permitted to marry mortals, nor do they suffer the fires of eternal damnation. Chapter Eight indicates that Satan, unlike God, accepts our weaknesses and shortcomings without judging us. This woman was one of the central characters throughout the series guiding Sabrina along the path of darkness. Sabrina ultimately signs her soul away to Satan in the finale. Please be aware that Hell, demons and Satanism do exist and are producing more and more followers. There are very active groups, such as the Satanic Temple, working to spread black masses in public spaces, and even install statues dedicated to the devil in places of common use. In October, two middle school girls in Bartow, Florida, hid in the bathroom with knives and scissors, waiting for the opportunity to kill small children and drink their blood. They admitted they were Satan worshippers. The girls confessed that their intention was to kill as many children as possible, stack the bodies at the door of their school, eat parts of their bodies, and then commit suicide. Please beware of this demonic series and share this story with others!